It’s official: the universe is weird. Our everyday experience tells us that distant objects cannot influence each other, and don’t disappear just because no one is looking at them. Even Albert Einstein was dead against such ideas because they clashed so badly with our views of the real world. But it turns out we’re wrong – the quantum nature of reality means, on some level, these things can and do actually happen. A groundbreaking experiment puts the final nail in the coffin of our ordinary “local realism” view of the universe, settling an argument that has raged through physics for nearly a century. To understand what Hanson and his colleagues did, we have to go back to the 1930s, when physicists were struggling to come to terms with the strange predictions of the emerging science of quantum mechanics. The theory suggested that particles could become entangled, so that measuring one would instantly influence the measurement of the other, even if they were separated by a great distance. Einstein dubbed this “spooky action at a distance”, unhappy with the implication that particles could apparently communicate faster than any signal could pass between them. What’s more, the theory also suggested that the properties of a particle are only fixed when measured, and prior to that they exist in a fuzzy cloud of probabilities. Nonsense, said Einstein, who famously proclaimed that God does not play dice with the universe. He and others were guided by the principle of local realism, which broadly says that only nearby objects can influence each other and that the universe is “real” – our observing it doesn’t bring it into existence by crystallising vague probabilities. They argued that quantum mechanics was incomplete, and that “hidden variables” operating at some deeper layer of reality could explain the theory’s apparent weirdness. On the other side, physicists like Niels Bohr insisted that we just had to accept the new quantum reality, since it explained problems that classical theories of light and energy couldn’t handle. It wasn’t until the 1960s that the debate shifted further to Bohr’s side, thanks to John Bell, a physicist at CERN. He realised that there was a limit to how connected the properties of two particles could be if local realism was to be believed. So he formulated this insight into a mathematical expression called an inequality. If tests showed that the connection between particles exceeded the limit he set, local realism was toast. And test they did. Experiments have been violating Bell’s inequality for decades, and the majority of physicists now believe Einstein’s views on local realism were wrong. But doubts remained. All prior experiments were subject to a number of potential loopholes, leaving a gap that could allow Einstein’s camp to come surging back. “The notion of local realism is so ingrained into our daily thinking, even as physicists, that it is very important to definitely close all the loopholes,” says Zeilinger. A typical Bell test begins with a source of photons, which spits out two at the same time and sends them in different directions to two waiting detectors, operated by a hypothetical pair conventionally known as Alice and Bob. The pair have independently chosen the settings on their detectors so that only photons with certain properties can get through. If the photons are entangled according to quantum mechanics, they can influence each other and repeated tests will show a stronger pattern between Alice and Bob’s measurements than local realism would allow. 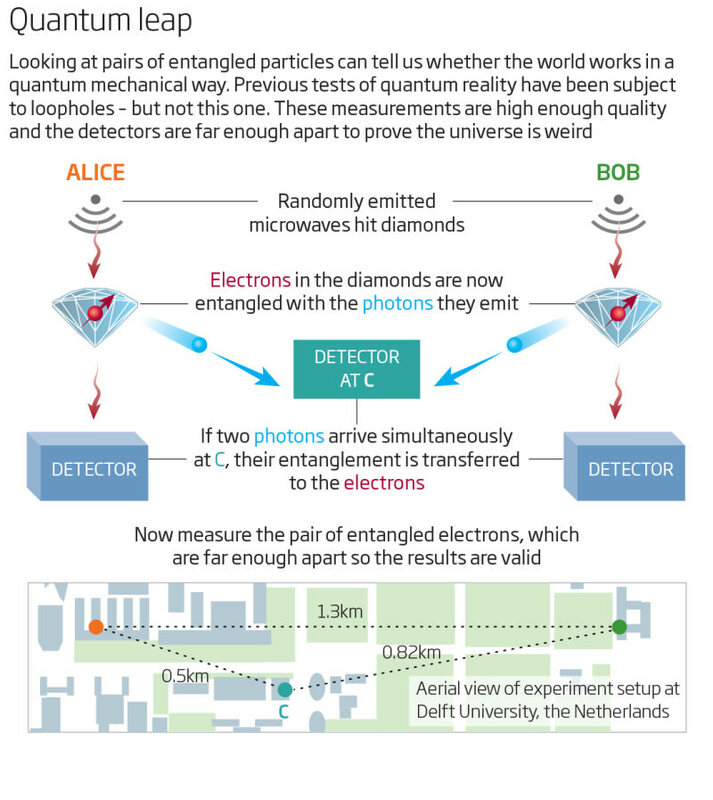 But what if Alice and Bob are passing unseen signals – perhaps through Einstein’s deeper hidden layer of reality – that allow one detector to communicate with the other? Then you couldn’t be sure that the particles are truly influencing each other in their instant, spooky quantum-mechanical way – instead, the detectors could be in cahoots, altering their measurements. This is known as the locality loophole, and it can be closed by moving the detectors far enough apart that there isn’t enough time for a signal to cross over before the measurement is complete. Previously Zeilinger and others have done just that, including shooting photons between two Canary Islands 144 kilometres apart. Close one loophole, though, and another opens. The Bell test relies on building up a statistical picture through repeated experiments, so it doesn’t work if your equipment doesn’t pick up enough photons. Other experiments closed this detection loophole, but the problem gets worse the further you separate the detectors, as photons can get lost on the way. So moving the detectors apart to close the locality loophole begins to widen the detection one. “There’s a trade-off between these two things,” says Kofler. That meant hard-core local realists always had a loophole to explain away previous experiments – until now. “Our experiment realizes the first Bell test that simultaneously addressed both the detection loophole and the locality loophole,” writes Hanson’s team in a paper detailing the study. Hanson declined to be interviewed because the work is currently under review for publication in a journal. In this set-up, Alice and Bob sit in two laboratories 1.3 kilometres apart. Light takes 4.27 microseconds to travel this distance and their measurement takes only 3.7 microseconds, so this is far enough to close the locality loophole. Each laboratory has a diamond that contains an electron with a property called spin. The team hits the diamonds with randomly produced microwave pulses. This makes them each emit a photon, which is entangled with the electron’s spin. These photons are then sent to a third location, C, in between Alice and Bob, where another detector clocks their arrival time. If photons arrive from Alice and Bob at exactly the same time, they transfer their entanglement to the spins in each diamond. So the electrons are entangled across the distance of the two labs – just what we need for a Bell test. What’s more, the electrons’ spin is constantly monitored, and the detectors are of high enough quality to close the detector loophole. But the downside is that the two photons arriving at C rarely coincide – just a few per hour. The team took 245 measurements, so it was a long wait. “This is really a very tough experiment,” says Kofler. The result was clear: the labs detected more highly correlated spins than local realism would allow. The weird world of quantum mechanics is our world. “If they’ve succeeded, then without any doubt they’ve done a remarkable experiment,” says Sandu Popescu of the University of Bristol, UK. But he points out that most people expected this result – “I can’t say everybody was holding their breath to see what happens.” What’s important is that these kinds of experiments drive the development of new quantum technology, he says. One of the most important quantum technologies in use today is quantum cryptography. Data networks that use the weird properties of the quantum world to guarantee absolute secrecy are already springing up across the globe, but the loopholes are potential bugs in the laws of physics that might have allowed hackers through. “Bell tests are a security guarantee,” says Kofler. You could say Hanon’s team just patched the universe. There are still a few ways to quibble with the result. The experiment was so tough that the p-value – a measure of statistical significance – was relatively high for work in physics. Other sciences like biology normally accept a p-value below 5 per cent as a significant result, but physicists tend to insist on values millions of times smaller, meaning the result is more statistically sound. Hanson’s group reports a p-value of around 4 per cent, just below that higher threshold. And there is one remaining loophole for local realists to cling to, but no experiment can ever rule it out. What if there is some kind of link between the random microwave generators and the detectors? Then Alice and Bob might think they’re free to choose the settings on their equipment, but hidden variables could interfere with their choice and thwart the Bell test. Hanson’s team note this is a possibility, but assume it isn’t the case. Zeilinger’s experiment attempts to deal with this freedom of choice loophole by separating their random number generators and detectors, while others have proposed using photons from distant quasars to produce random numbers, resulting in billions of years of separation. None of this helps in the long run. Suppose the universe is somehow entirely predetermined, the flutter of every photon carved in stone since time immemorial. In that case, no one would ever have a choice about anything. “The freedom of choice loophole will never be closed fully,” says Kofler. As such, it’s not really worth experimentalists worrying about – if the universe is predetermined, the complete lack of free will means we’ve got bigger fish to fry.